99.9997% of all humans are wiped out by a very suspicious virus. SIMPOC’s Artificial Intelligence programmer doesn't come into work that day the next; or ever again. The commander of the space station Oasis, Joan Herl is forced to abandon the station because of dwindling resources and the impact of the virus. 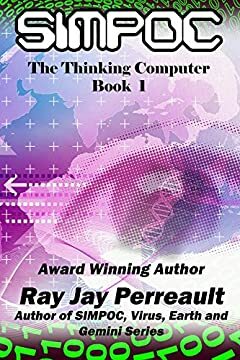 When they land on earth, they are attacked by another thinking computer who would do anything to, protect itself and to continue thinking. The moon colony, Dessert Beach, is trapped as their resources are running out and they must decide when to come home. They have only lifeboats to carry them back to the lifeless earth and what will they find when they enter the atmosphere and land. The astronauts trapped on the Mars colony Red Dirt are in worse condition. Their systems will break down, and resources will run out. Coming home for them is a different story. The lifeboats aren't made for that purpose and must be rebuilt before the colony breaks down. Should they stay and take their chances on Mars, or should they journey back to earth?